Your Commonage .ie: The opening of the GLAS Scheme is imminent. All the indications suggest that the opening of the GLAS scheme will be announced next week. We know that the Basic Payment Scheme will open for on line applications this week and that the final Advisor Commonage Course finished last Friday (13/2/15) and the Minister for Agriculture announced in his Radio interview just over a week ago that GLAS would open within 10 days. It is now expected that the schemes opening will be announced at the Fine Gael Ard Fheis in Castlebar on Friday. The window for applications is very narrow, (only 84 days), in reality because of the need to complete Basic Payment Scheme applications during the same period it will effectively close much sooner than that. Farmers must move quickly. Yourcommonage advisors are available to help any farmer access the scheme, not just those with commonage. We can guarantee that our prices for GLAS applications will be at least 15% cheaper than Teagasc. 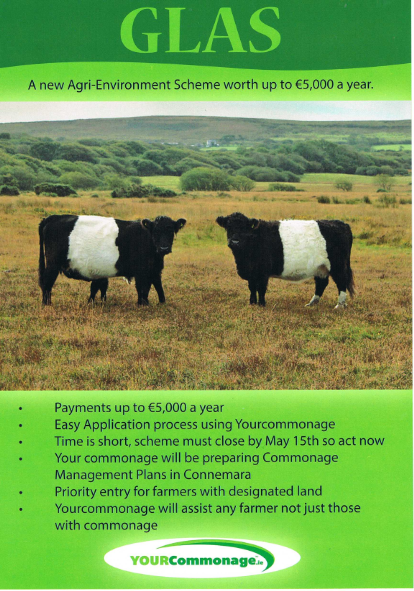 In addition we will offer a substantial discount on the cost of a Commonage Management Plan to farmers who had their individual GLAS application prepared by one of our advisors. For farmers with 2 or more commonages there will an additional discount on the cost of second or subsequent Commonage Management Plans.